Cleanblend Blender Review 2019 - Cheapest Commercial Blender ? Cleanblend Blender Review 2019 – Cheapest Commercial Blender ? If you are looking for a high-performance blender but can’t afford the typical $400+ price tag, then the Cleanblend blender might be the best option for you. The 3HP 1800 watt commercial blender from CleanBlend is marketed as being able to match the power and features of a Vitamix at less than half the price. The big question is, how does the Cleanblend blender actually perform ? 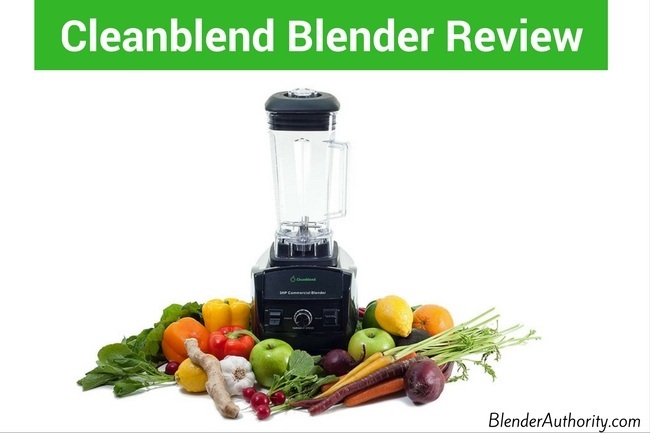 In this article, I will review the CleanBlend commercial blender in terms of its features, performance, and comparison with other similar blenders. The Cleanblend has a 3 horsepower motor which 1800 watts of power. This is a good power rating for a blender and can perform most of the blending tasks expected from a high-end blender. It comes with a 64-ounce capacity BPA-free shatterproof Tritan plastic jar. The jar also integrates a tamper like Vitamix to help with thick recipes and food processing. The blades are made of stainless steel and it uses sealed ball bearings. It has a manual speed dial and a pulse option. Honestly, the controls for this blender look much like those of the poopular Vitamix 5200. I am sure you are wondering how this blender performs if it is priced that low. The Sweet Home did a multi-year extensive blender test and said Cleanblend was consistently one of the best-performing blenders in its tests and one of its top picks. It performed very well in blending tests and generated a fine consistency when pureeing ingredients. Eater.com did an extensive comparison test of high-end blenders and found that the Cleanblend was one of the only blenders to puree berry seeds and was one of the best performing blenders for making fine-textured smoothies and mixed drinks. From my research, the Cleanblend commercial blender will pretty much do every blending task that you require it to. Most of the customers who reviewed the product stated that it was able to crush ice, puree berry seeds, make creamy smoothies, liquify soups, and blend frozen drinks without too much effort. The manufacturers also says that it can make nut butter in under a minute which is pretty impressive. I didn’t find much feedback about how it performed in milling flour but it seems to have the power to handle that task. Positives: The biggest advantage to this blender is that it costs almost half the price with similar performance compared to blenders with similar features from other manufacturers. The cleanblend 3HP 1800 watt blender is powerful enough to perform all tasks that you will task it with. It makes smoothies with excellent consistency and has the horsepower to handle more intensive blending jobs. There is little difference between how this blender performs its tasks as compared to its peers from the other better-known brands. The customer service offered by CleanBlend has been described by customers as nothing short of spectacular. If the reviews online are anything to go by, CleanBlend readily replaces all faulty blenders without issue. One customer who stated that they had a problem with their blender said Cleanblend replaced it, did not even ask them to return the broken one, and gave them their money back. The company continues to maintain very strong customer ratings for the last 5 years. It comes with a 5 year warranty and a free 30 day return policy. Cleanblend’s Jar is BPA-free and made of high-quality Tritan plastic which is the same impact-resistant material that the other top brands use. Negatives: Like the Vitamix 5200, the Cleanblend does not come with preset speed dials. You will have to make all your smoothies, shakes, ice creams and nut butter based solely on your judgment. Also, with the manual speed dial, some testers commented that there is not much difference between the high and low speed on the Cleanblend especially compared to the Vitamix variable speeds. The other negative is the jar isn’t as sturdy feeling as the Vitamix. Also, like the Vitamix standard blender, the Cleanblend is too tall to fit under a typical 19” countertop upper cabinet. Finally, the CleanBlend is also a relatively new company compared to other well-established blender manufacturers, but I found nothing but positive feedback from users about Cleanblend’s customer service and satisfaction ratings after six years on the market. 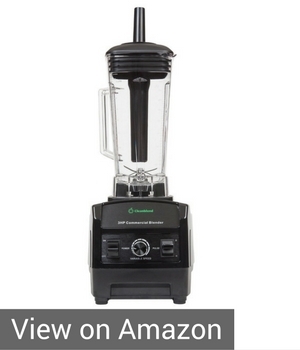 There are a lot of Vitamix blender models but the classic, most tested Vitamix model is the 5200 which is what the Cleanblend is obviously modeled after. The first thing that you should note about these two is that their physical appearance is very similar and you can easily mistake them at first glance. A distinguishing difference in appearance would be the position of the dials and Vitamix’s handle with a rubber grip. They both have the same capacity and also have stainless steel blades. They both have a free 30 day return guarantee but the Vitamix has a longer warranty at 7 years while the Cleanblend blender offers 5 years. However, the cleanblend is half the price of the vitamix 5200. Overall, you can’t beat Vitamix’s quality long term especially if you will be using it for horsepower-intensive tasks. The Cleanblend will perform well for most tasks and should last a long time if you use it properly. Actually, Eater.com testing found that the Cleanblend made smoother smoothies than the Vitamix. Also, Vitamix is made in the USA and Cleanblend is made overseas. For the price, Cleanblend is hard to beat and should be fine for most users, but Vitamix has the long history of market-leading quality which you pay more for. For more details on Vitamix, see my Vitamix buying guide. Side Note on Vitamix– If you decide on Vitamix, you can get a factory certified refurbished Vitamix blender that is in perfect condition with a Vitamix 5-year full warranty(instead of a 7 year warranty that comes with a full-priced new Vitamix). Among Oster blender models, the Oster Versa Pro is the most comparable to Cleanblend. The Oster Versa Pro comes with preset speed dials that are not available on the CleanBlend 3HP 1800 watt blender. This is probably the first difference that you will notice when you look at the two side-by-side. They both have the same 64-ounce jar capacity made of Tritan plastic. They also both have stainless steel blades. The Oster has more control features and a wider range of variable speeds than the Cleanblend. However, Cleanblend’s motor is more powerful at 1800 watts compared to the Osterversa’s 1400 watts motor. Reviewers will tell you that the CleanBlend’s smoothies are creamier than Oster’s. You can attribute this to the more powerful motor. 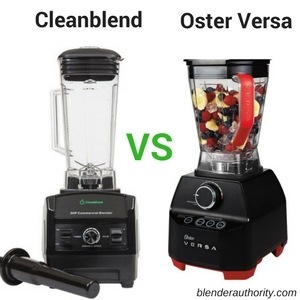 The Oster Versa Pro is a decent blender but the Cleanblend has better feedback on durability. I compared these two blenders in more details in our Best Blender under $200 article. Blendtec has a lot of blender models. The Blentec Designer with Wildside jar has been tested against the Cleanblend in various tests including The Sweet Home. The Blendtec is priced in the mid $300’s and provides 1560 watts with 3 peak horsepower. The Blendtec has some nice control features with six preset settings that will help you take the guesswork out of blending. It comes with a 7-year warranty compared to the CleanBlend’s 5 years. However, Blendtec’s motor is not as strong as it is only 1560 watts compared to Cleanblend’s 1800 watts. The Blendtec Designer model also comes with a wildside vortex container design which some people feel helps with blending. Also, for sizing, the Blendtec is shorter and will fit under your kitchen cabinets easier. 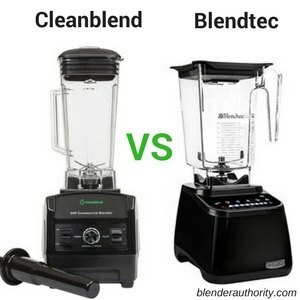 Overall, The Blendtec is a quality blender that will last a long time but it didn’t perform noticeably better than Cleanblend in the tests that I reviewed. The Blendtec does have some nice control features with a quality feel and a reputation for quality. If you need a blender for heavy use, then it might be worth paying up for a Vitamix or Blendtec just because of their known reputation. On the other hand, Cleanblend has been on the market for about 5 years with solid feedback and does provide similar performance for much less so I will leave it up to you how important price is to you. The CleanBlend 3HP 1800watts blender is a great choice as a powerful, affordable blender. UPDATE 2019 – This review was originally written in 2017 and has been updated for 2019. Overall, the Cleanblend continues to perform very well with excellent durability at a very attractive price. Its functionality is quite good as it will perform almost any blending task with great efficiency. 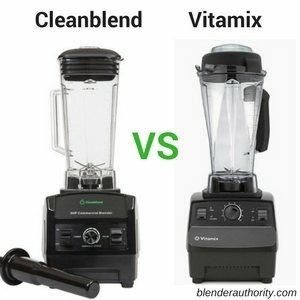 All the blender comparison tests I read, concluded that the Cleanblend consistently performed near the top of all blenders tested. However, compare your space requirements and longevity you would want for a blender before making that final decision. It is a powerful blender for the price. It might not have the reputation Vitamix or Blendtec but should last a long time if used properly. See Current Price on Cleanblend Commercial Blender. Please share if you found this review useful. Leave a comment below if you have any questions about this review. Can I buy only pitcher ? If yes , how to buy.